Happy 2nd birthday! I can't believe it's been two years since I've held you (in my belly). I still long and ache for the day when I will finally hold you in my arms. On the way to Mass this morning, your big sister, Maria, remembered that it was your birthday and was talking about it. We decided, as a family, that we would offer our Mass for you today, as our birthday gift to you. We also talked about how, if you are in heaven already, that means that you were participating at Mass with all the saints...so we got to celebrate with you today, after all. My little Love, I still ache for you and miss you. I don't think that will ever go away. You are our sweet "bonus child," the one who ended a long stretch of infertility. I will never forget how filled with joy Daddy and I were, when we found out you were in my tummy. Whenever people ask your big sisters about their siblings, they are always eager to tell people, "There are actually four of us! We have a baby brother in heaven." When Mommy is so sick during pregnancy, one of the things that keeps me going is thinking of how much the older siblings will delight in having a new baby. Even though they never met you or held you, you are truly a joy to your big sisters. They love you so much. In the two weeks between your ultrasounds, I spent a lot of time praying. I prayed that you would live, but I think I also prayed that God would accept my baptism of desire for you, if you died. We also had the doctor who delivered you conditionally baptize you. You were blessed by priests while still alive, and you had a whole army of priests and seminarians storming heaven for you when you died. And so, I have great hope that you are, indeed, in heaven. I wonder what your life has been like, since we said goodbye to you. You are the first of our children to leave our nest, and you are (hopefully) the first to have reached heaven. I dream about what it will like for the six of us to be reunited one day, and I treasure the foretaste of that at Mass. Each of you four children have changed our family. Each of you four have changed me. 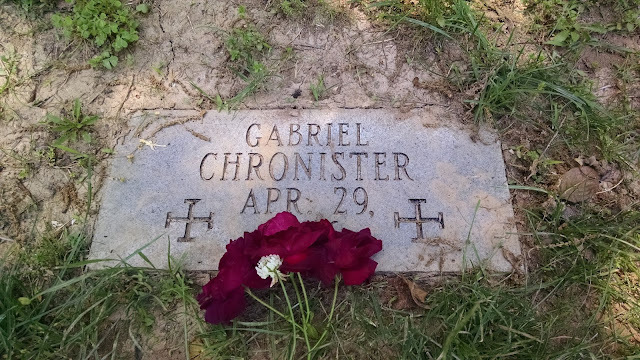 When I lost you, Gabriel, heaven became more real to me. Our family gained an intercessor. I am especially amazed by the power of your prayer for your sisters. Whenever one of them is sick or injured and I am worried, I ask for your prayers . I think your prayers are a big reason why we didn't lose baby Zelie, and they have helped your big sisters on more than one occasion. It brings me joy to see how God works through you. As much as I have grieved over you, my child, you have brought me so much joy. It makes me so happy to know that you are becoming -and perhaps already are - the saint that God has created you to be. You've taught me how to be a mother - how to love despite knowing that I have to let go. Daddy and I know that, ultimately, you are God's. We treasure the four of you. Oh my sweet Gabriel. My love goes with you always. I hope and pray that you may be in heaven, and "spend your heaven doing good on Earth."